We’ll start from the start, then. No, the cover wasn’t the worst thing about the Magazine – not even close. Nor it is the fact that there is no spine design, just an inky blackness. Rather, it’s the brutal inconsistency that runs like a plague throughout the entire 128 pages. Consistency is the key factor here, folks. Without it, there is no sense of “yeah, this all reads like the same book”, or, “yeah, this magazine looks and feels the same throughout”. Consistency in any publication is what will make it have a sense of balance, and without it, that balance just isn’t there. Sure, some factors of the magazine display some semblance of consistency – the gold stripes adorning the top and bottom of each page are fantastic examples of this, as are the page numbers (something that should damned well be consistent anyway). It’s the non-consistencies that break it – the different font sizes, different fonts themselves, the rounding/non-rounding of photos, the different placements of photos, etc, etc. The list goes on! At some points, it’s like the pages themselves have markedly different designs – from where the pictures are placed, where the text is, and to how the page is “styled” – from page to page, it’s remarkably different – and not in a good way, either. I suppose the “doing each page individually” methodology would work if there was just one person working on the magazine as a whole – that way, that person would know how each page was styled, and could stick to a “routine” when doing the pages. But damn, I’d hate to be that one person – talk about a lot of work! I suppose it would be okay if all the content was provided for you – all pictures greyed and named, etc. What also doesn’t help is the fact that the “editing” process mucks around with the page itself – removing photos when all the other photos are of lesser quality doesn’t help. Ah, whatever. Hopefully all those days are behind me now – time for some fresh faces to step up to the plate. You’ll notice that I used a lot of quote marks in this post – what I’ve said inside them doesn’t necessarily reflect what their actual meanings are. By this, I mean that the “editing” process isn’t necessarily just fixing typos. Here’s a short vid I made when the awesome Radi8 team went to the Hobart event of the Relay For Life 2009 event up the Domain. If you’re asking, the backing music is “Break Me Down” by Christian City Church. I can’t seem to find it on iTunes at the moment, though. Apologies. It’s about time we had a post about the internet. 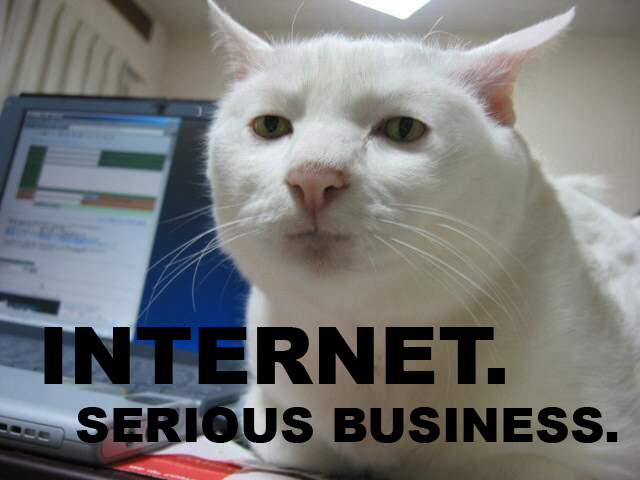 After all, the internet is serious business (eneyclopedia dramatica, and therefore Not Safe For Work). Your parents aren’t kidding when they tell you to be careful on the internet – don’t chat to people you don’t know, don’t give out any personal details to sites you don’t trust, etc etc. I’m sure you’ve all heard it before. Unfortunately, sites like Omegle are too funny to give up. Omegle is a site for you to chat to random strangers about anything from your day to the last game you played, with no real obligations to them other than to chat. It’s completely anonymous, but there’s nothing stopping you from giving out personal details (don’t. It’s not recommended). Please note that I use Omegle purely for the lulz – for the “laffs”, if you will. It’s more than hilarious trying to convince people that “you’re from the internet”, playing the numbers game (getting people to count with you – either with prime numbers, or if you’re really daring, mersenne primes), or just seeing how fast you can get the other party to disconnect. I’ve also found that convinving people you wrote the lyrics to Rick Astley’s “Never Gonna Give You Up” smash hit is pretty funny, as well as TYPING IN ALL CAPS. Also, asking (reasonably) complicated maths questions like “What part of ƒ’(x)=kƒ(x) do you not understand? !” as an opening statement also confuses people to no end, usually resulting in hilarity (for me, not for them). Overall, Omegle can be hilarious. So hilarious, in fact, that I’ve started a Tumblr blog that will contain all the hilarious Omegle conversations I’ve had. You can check out the site here – if you want to contribute, hit me up on my email address: bennylingbling at gmail dawt com. This site is made in conjunction with i3network and it’s creator, Adam D.
That’s about it for now. Later on today, I’ll post up a vid of Relay For Life 2009, and all the lulz that ensued there. It’s uploading as we speak – and my internet is being really slow as a result. Be safe on the internet, peoeple. I’m being serious about this – there’s nothing funny about it. Do NOT, whatever you do, give out personal details like where you live, your real name, or your phone number – anything that can be associated to you. Even your real email address – make one up. I’m serious. It’s not worth it. DON’T DO IT! Society these days is all about making decisions. However, you run into a couple of problems when you have more than one decision to make – and they’re all as enticing as each other. I’ll admit that those examples are a little extreme, but do you get the picture? Not all decisions can be made instantaneously – to this end, I’ll take my time to decide whether I want fries with that, thank you very much. What most people don’t realise is that most of our choices have consequences. If you don’t stop at that roundabout, then you’ll have a crash, and possibly become paralysed. If you have fries with that every single time, you’ll become obese. Sure, not all of these are strictly true, but again, do you get the picture? Hmm. This is become futile. I’m running out of examples… Time for closing statements, I think. At the end of the day, it’s up to you to make the decision. Pray to whatever diety you believe in to give you wisdon in your choice – but most importantly, once you’ve made you choice, stick with it!